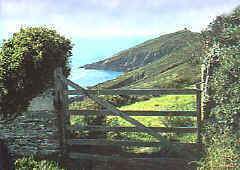 Self Catering Holidays, Bed and Breakfast Holidays in Rame Peninsula. The tranquil beauty of the Rame Peninsula, Cornwall's "forgotten" corner is an awe inspiring experience for visitors who venture into this picturesque area of gently rolling hills, quiet beaches and tidal creeks. The Rame peninsula is surrounded by water, bordered by the sea, the River Lynher, the River Tamar and Plymouth Sound. The Rame Peninsula makes an ideal holiday destination, with plenty of variety - offering holidays in quiet locations, with easy access to Cornwall and Plymouth and the South Hams via the Torpoint ferry. 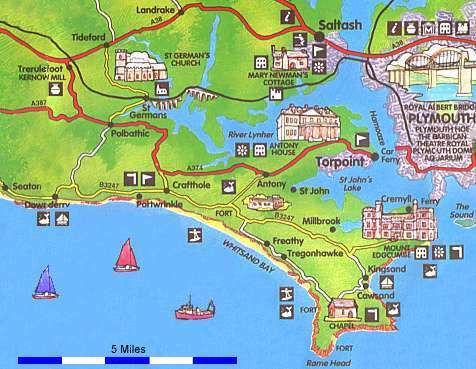 The Rame Peninsula has several villages - each with their own special character, Antony, Cremyll, Kingsand, Cawsand, Millbrook, St.John, Sheviock, Wilcove, Crafthole, Downderry, Portwrinkle, Seaton, Freathy & Whitsand Bay and of course the town of Torpoint, with its car ferry service, taking people across the River Tamar into Plymouth. On the banks of Plymouth sound is Mount Egecumbe country park, overlooking the sea, this is a favourite visitor attraction. The Park and Historic house is a great family day out, with wooded walks, beaches and picnic areas - plus those stunning views across Plymouth Sound and the River Tamar. The Cremyll Passenger Ferry runs a regular service from the landings - adjacent to the main entrance of the country park - across the river to Plymouth and and in main holiday season, the Weston Maid, runs regular boat trips from the Barbican in Plymouth across Plymouth Sound - to Cawsand Beach.